Trainer Jamie Edwards expects Gambeson will improve after he scored an impressive win at his stable debut at Ararat on Friday. Jamie said the former Godolphin galloper hadn’t been screwed down for his first run in nearly seven months despite being heavily backed from $2.80 to $1.95. “I know there is a lot left in the tank with him,” Jamie said. “Every time we have given him a gallop he has improved a bit and he has come here probably 85 per cent fit. Gambeson is an outstanding looking son of Street Cry and he impressed Dylan with how he weathered a full-on attack on the pace in the Bet365 Maiden (1100m). “I got attacked for a long way and was concerned it might have taken away from his finish,” Dylan said. Gambeson held off a challenge from dual city-placed Yoelqui ($2.70) to score a length win. They cleared out from the rest, with Black Bacardi finishing 6-1/4 lengths away in third place. Star Moola who pressured Gambeson for a long way dropped out and finished last of the six runners, beaten 12 lengths. Gambeson is the second Godolphin horse Jamie has bought for owner Brian O’Dwyer who last October celebrated a Benalla victory with Honeywine. Jamie said Gambeson, who was placed twice in six runs for Cummings, should train on to longer races. 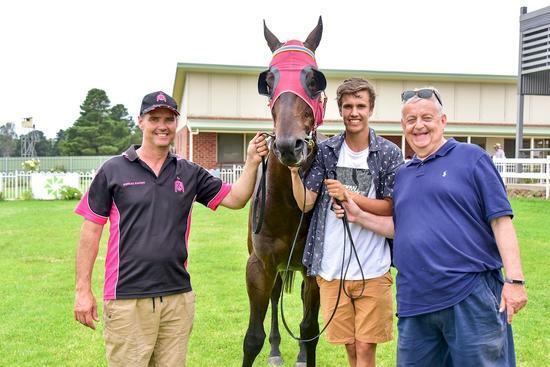 “He might be a nice horse in the making and be better over 1400m or 1600m,” Jamie said.